Screen patients for acute kidney injury and other conditions that may reduce renal function. For patients at risk for chronically reduced renal function (for example, age > 60 years, hypertension, or diabetes), estimate the glomerular filtration rate (GFR) through laboratory testing. 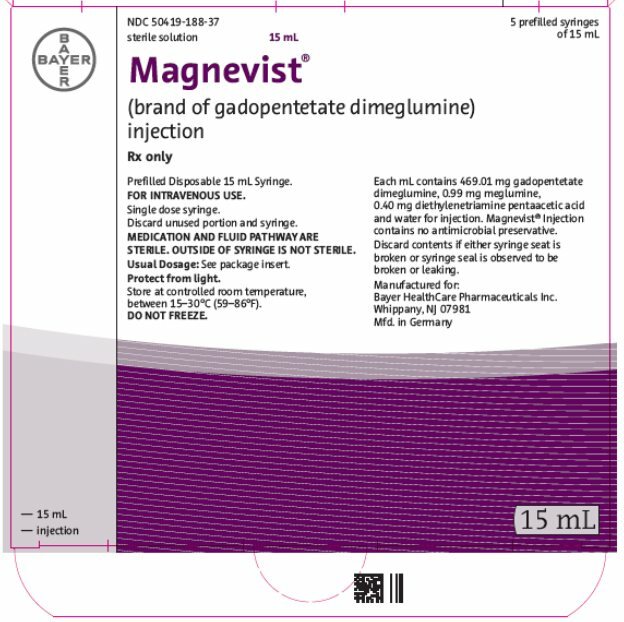 History of severe hypersensitivity reactions to Gadopentetate dimeglumine. The most common adverse reaction was headache (4.8%). The majority of headaches were transient and of mild to moderate severity. Other adverse reactions that occurred in ≥ 1% of patients included: nausea (2.7%), injection site coldness/localized coldness (2.3%) and dizziness (1%). General Disorders and Administrations Site Conditions: Adverse events with variable onset and duration have been reported after GBCA administration [ see Warnings and Precautions (5.3)]. These include fatigue, asthenia, pain syndromes, and heterogeneous clusters of symptoms in the neurological, cutaneous, and musculoskeletal systems . 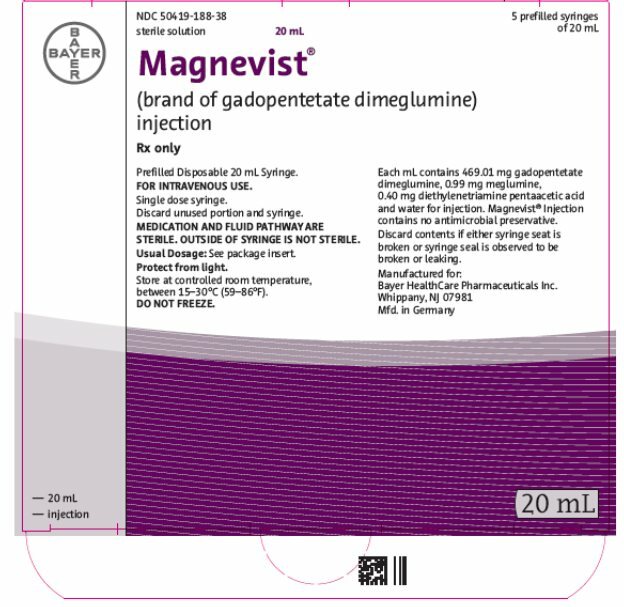 Limited literature reports that breastfeeding after gadopentetate dimeglumine administration to the mother would result in the infant receiving an oral dose of 0.001 to 0.04% of the maternal dose. There is no information on the effects of the drug on the breastfed infant or the effects of the drug on milk production. Additionally, there is limited GBCA gastrointestinal absorption. The developmental and health benefits of breastfeeding should be considered along with the mother’s clinical need for Magnevist and any potential adverse effects on the breastfed child from Magnevist or from the underlying maternal condition. Magnevist is a prescription medicine called a gadolinium-based contrast agent (GBCA). 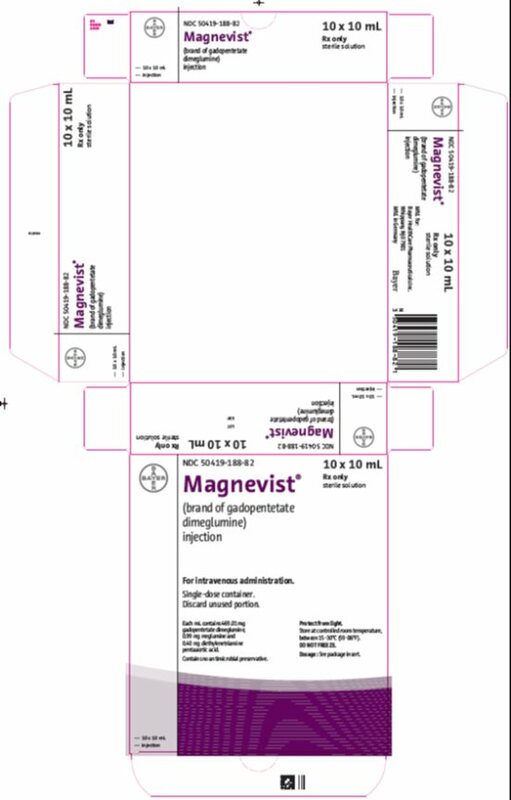 Magnevist, like other GBCAs, is injected into your vein and used with a magnetic resonance imaging (MRI) scanner. An MRI exam with a GBCA, including Magnevist, helps your doctor to see problems better than an MRI exam without a GBCA. 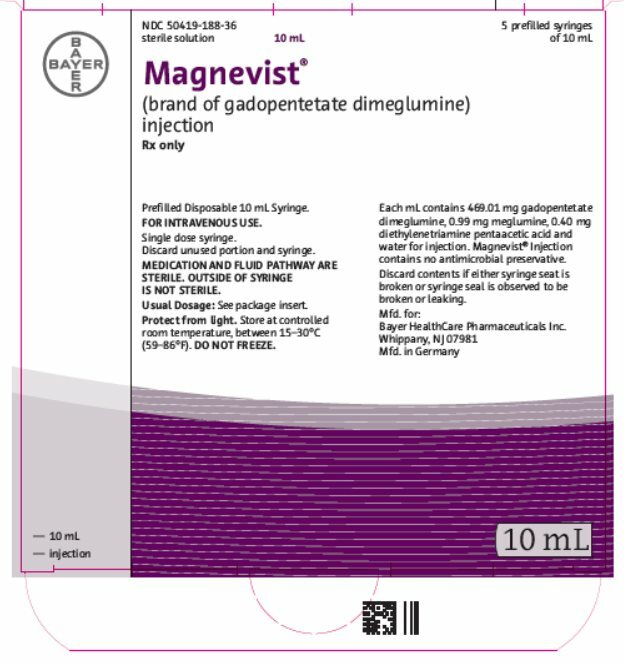 Magnevist contains a metal called gadolinium. Small amounts of gadolinium can stay in your body including the brain, bones, skin and other parts of your body for a long time (several months to years). Rarely, patients can feel pains, tiredness, and skin, muscle or bone ailments for a long time, but these symptoms have not been directly linked to gadolinium. Some people with kidney problems who get gadolinium medicines can develop a condition with severe thickening of the skin, muscles and other organs in the body (nephrogenic systemic fibrosis). Your healthcare provider should screen you to see how well your kidneys are working before you receive Magnevist. are pregnant or plan to become pregnant. 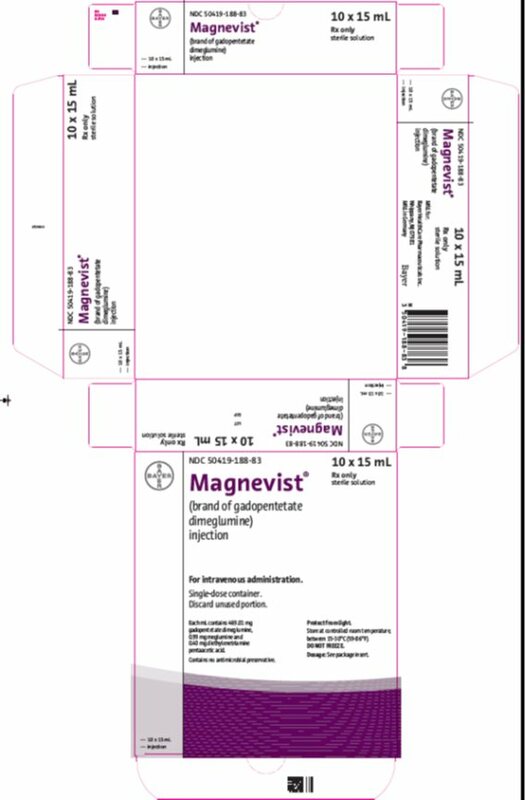 It is not known if Magnevist can harm your unborn baby. Talk to your healthcare provider about the possible risks to an unborn baby if a GBCA such as Magnevist is received during pregnancy. Allergic reactions. 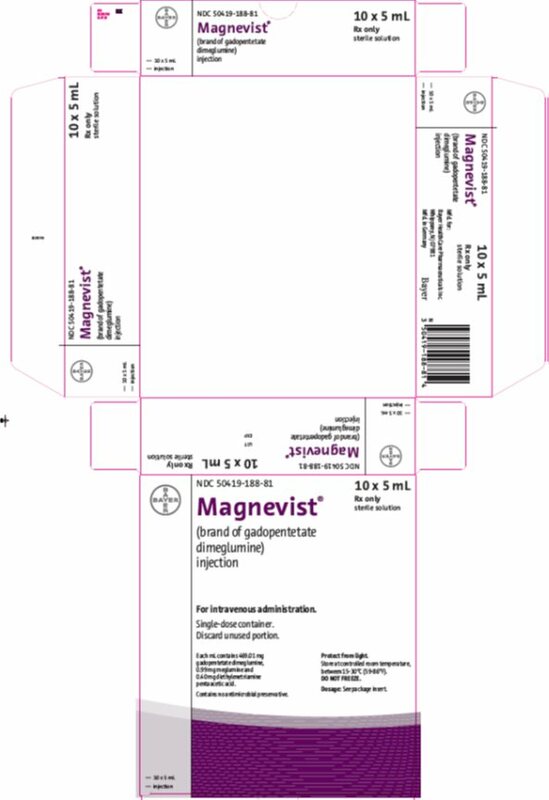 Magnevist can cause allergic reactions that can sometimes be serious. Your healthcare provider will monitor you closely for symptoms of an allergic reaction. Protect from light. Store at controlled room temperature, between 15–30°C (59–86°F). DO NOT FREEZE.